Number : Season 4, episode 3 of 9. Which One : Troughton’s first turn. Written By : David Whittaker & Dennis Spooner. First UK Broadcast : 5 November – 10 December 1966. Plot : The newly regenerated Doctor masquerades as a visiting Examiner, in an Earth colony on planet Vulcan and runs into some Daleks. Whats good : Solid low-key Dalek adventure. Troughton brings a different, more welcome youthful tone to the show. Murder-mystery. Whats bad : It is a bit long at 6 parts. Troughton hasn’t quite found his feet yet. Later scenes use painfully obvious still backdrops to simulate more Daleks. Review With Spoilers : The Power Of The Daleks, is the 3rd episode of season 4 and the first full appearance of the new Second Doctor; Patrick Troughton. Having recently regenerated, the Second Doctor is confused and attempting to understand his new younger body and changed personality. Landing on the desolate planet Vulcan, the Doctor meets a wandering human who is promptly murdered by an unseen foe. The Doctor takes the dead man’s Examiner credentials and travels to a nearby colony, to investigate the murder. Once there, the Doctor discovers that the colonists are keeping a small army of deactivated Daleks; rescued from a crashed pod and are unwisely working on trying to reanimating them. After the huge Dalek epics, of The Dalek Invasion Of Earth and The Dalek’s Masterplan. Producers wisely go for a more low-key Dalek number, to welcome and warm-up the new Doctor. The Power Of The Daleks brings together a murder-mystery, permeated with the overhanging threat of a sleeping Dalek army. The Daleks, once awakened by mad scientist Lesterson, initially take on an obedient servant role – which is kind of creepy. It’s a position we haven’t seen them in before; fetching and carrying drinks for humans. It is all a ruse though and when the Dalek’s finally unleash their true intentions – in episode 4; the Colony and most of the Colonists – go up in exterminated smoke. The Power Of The Daleks title is synonomous and has a double meaning, throughout this episode. 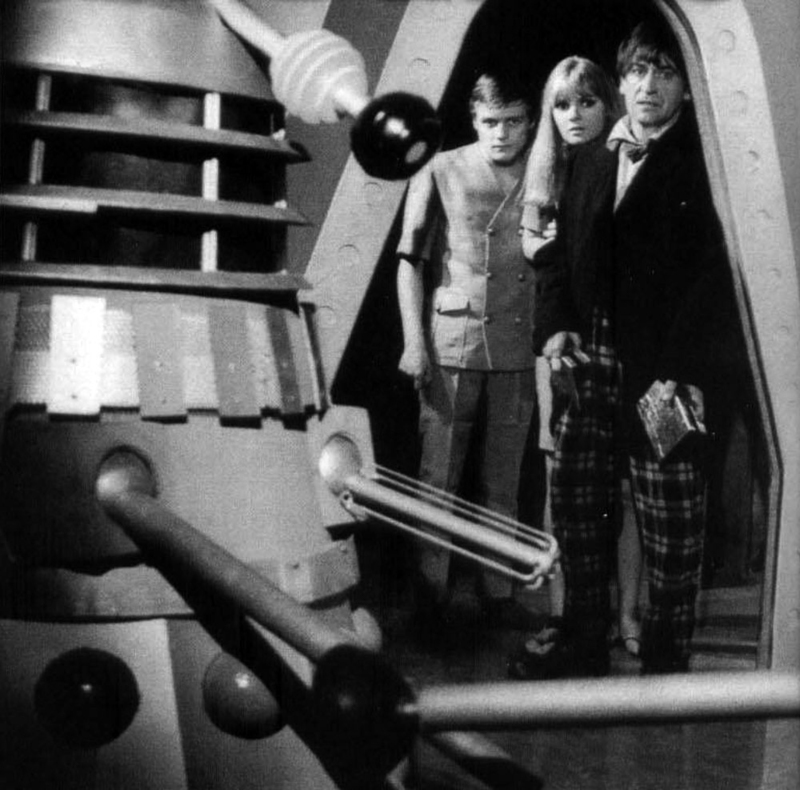 The Dalek’s require static power to re-animate, provided by Lesterson’s mad experiments and the Dalek’s eventually unleash their power on the Colonists. Patrick Troughton’s first outing, is a nervy affair and he spends much of the episode attempting to find his feet – in the massive shoes left by William Hartnell’s departure. He does however, show enough to see why producers decided that Troughton was the only man to fill the role. Troughton gives the programme a new, more youthful verve. The Power Of The Daleks is a sometimes nervy but entertaining low-key Dalek adventure. Intended to blood the new incoming Doctor and it does work well – for an opener.